We are a leading Manufacturer of vacuum sterilizer from Ahmedabad, India. The sterilizers are used in the medical and Healthcare industry on a large scale. These devices are very useful for the sterilization of the medical tools and equipment by using the various technologies. In the market, steam sterilizer and high-temperature sterilizers are available. 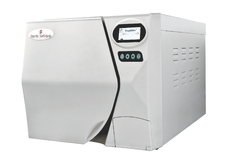 The Vacuum Sterilizer is also available for the sterilization process in the medical industry and hospitals. These devices are made to work on the science of vacuum to prevent all kinds of harmful bacteria, viruses and fungus in the medical tools. These devices come with various capacities and sizes to use in the medical industry for sterilization.